Digicom wins €100k tender for managed print services. Digicom and Ricoh will cut Eurofound’s print costs and increase productivity. 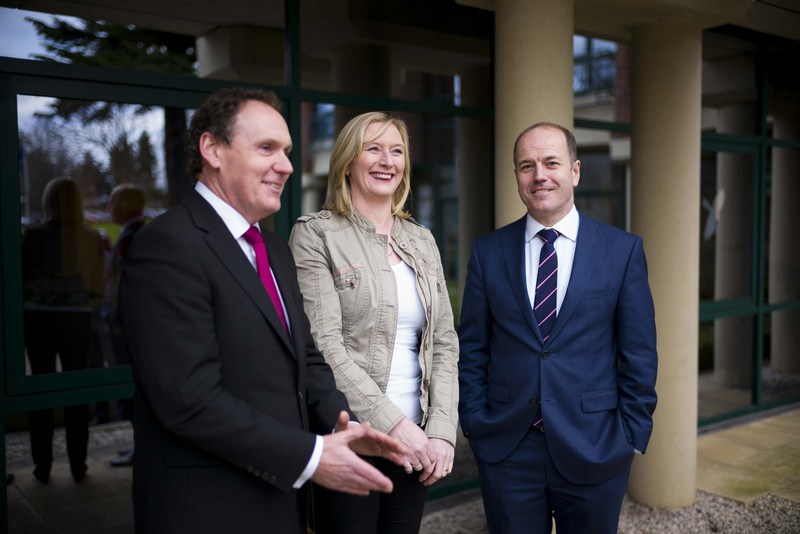 Pictured at the announcement are L-R; Ray Byrne, channel director, Ricoh Ireland, Linda Byrne, ICT Assistant and Technical Support, Eurofound and Greg Clarke, managing director, Digicom. EU research agency based in Loughlinstown, Dublin invests initial €100K in new managed print service, with potential to grow this to €200K at renewal. Digicom announced today (6 Feb 2017) that it has deployed a new managed print service (MPS) for Eurofound. The new service is helping the agency to cut print costs by one-third and hardware by over 80%. It will also boost staff productivity, document security and more sustainable printing. The initial contract is valued at €100,000, with potential to grow this to €200,000 at renewal. As mentioned above, the deal has helped Eurofound reduce its print fleet by more than 80%. This, in turn, has led to a huge cut in the amount of time spent fire-fighting problems with aging hardware. Eurofound (the European Foundation for the Improvement of Living and Working Conditions ) is a tripartite EU Agency that gathers social and work-related policy research and information. It has its headquarters in Loughlinstown, Dublin. The agency was established in 1975 to contribute to the planning and design of better living and working conditions in Europe. It carries out its role in partnership with governments, employers, trade unions and the European Union institutions. Digicom is a specialist in the areas of audio-visual and document management. It offers an extensive range of leading brand names together with impartial advice. As independent consultants, it works closely with customers to ensure they get the most effective technology option for their needs. The company’s goal is to deliver a value-added solution to the customer, one that will enhance their business processes and optimise productivity and efficiency within the organisation. Ricoh is a global technology company that has been transforming the way people work for more than 80 years. Under its corporate tagline – imagine. change. – Ricoh continues to empower companies and individuals with services and technologies that inspire innovation, enhance sustainability and boost business growth. These include document management systems, IT services, production print solutions, visual communications systems, digital cameras, and industrial systems. Headquartered in Tokyo, Ricoh Group operates in approximately 200 countries and regions, including Ireland and the UK. In the financial year ending March 2016, Ricoh Group had worldwide sales of 2,209 billion yen (approx. $19.6 billion USD). Ricoh, Digicom and Eurofound logosFollowing a highly competitive tender process, Digicom was awarded the contract to implement the managed print service for Eurofound, based on the latest digital print technologies from Ricoh. The new solution involved replacing 75 desktop printers with 12 office-based Ricoh Multifunctional Printers (MFPs), two larger production printers from Ricoh and an additional Ricoh MFP in the Brussels office. The Digicom and Ricoh MPS has reduced the cost of print at Eurofound and helped to make staff more productive, due to the speed and efficiency of the new technology which is enabling staff to produce documents and reports more quickly. The MPS also provides Eurofound staff with Follow Me printing functionality, enabling greater mobility and flexible working. With team members regularly traveling to Brussels to discuss and report on specific projects to the EU, they can avoid travelling with confidential reports and can print their documents locally when they arrive. Having to swipe proximity cards to release print jobs not only improves Eurofound’s document security, it also helps to reduce waste by cutting out unwanted printing. With improved document scanning processes also part of the new solution, Eurofound is benefitting from more sustainable printing practices and expects to cut the number of pages printed annually by 100,000.